Have You Read The Policy Address? 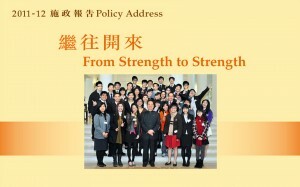 Do you know our Chief Executive Mr. Donald Tsang delivered the Policy address yesterday? Yes? Good. Then I will ask you 10 questions. See if you can answer them. Some are straightforward. Some are a bit complicated. If you can answer more than 5, Good! You are quite aware of the current issues. If you can answer more than 7, Excellent! You have a strong inquiry mind and self-directed learning attitude. If you can have answers for all the questions, you are really brilliant! Get ready? Make guesses now. Well, can you get the answers for all questions? I will post up on the school website. Number 10 is special because it may not have right or wrong answer but requires you to elaborate and explain with a critical mind. So Today’s lunch talk has come to an end and I wish all of you would always bear in mind to care about our community and the world, read more news and think more with an inquiry mind and self-directed learning attitude. Thank you.